I am pleased to inform you that we have reached agreement with Mira Adanja-Polak, journalist and news commentator of TV Belgrade, to represent her on an exclusive basis in the United States of America. We anticipate that our cooperation will begin with written articles and interviews about life in Yugoslavia and later include film, radio and TV reports as well. We plan to offer her materials to such leading American newspapers as the New York Times, the Washington Post, the Chicago Tribune, the Boston Globe, the Los Angeles Times, etc., and to the leading American television networks. 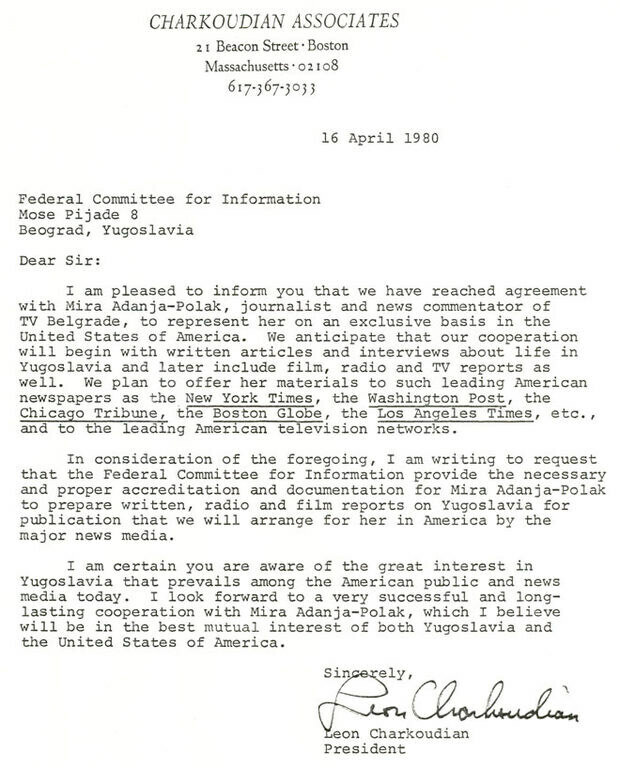 In consideration of the foregoing, I am writing to request that the Federal Committee for Information provide the necessary and proper accreditation and documentation for Mira Adanja-Polak to prepare written, radio and film reports on Yugoslavia for publication that we will arrange for her in America by the major news media. I am certain you are aware of the great interest in Yugoslavia that prevails among the American public and news media today. I look forward to a very successful and long-lasting cooperation with Mira Adanja-Polak, which I believe will be in the best mutual interest of both Yugoslavia and the United States of America.